Description: The organ is located in a middle-sized baroque church in Valsolda/Italy near Lugano. Due to large amount of marbled walls, the architecture has surprising acoustical properties with a rich and long reverberation. The organ was built by a the Ticinese organ manufacturer Michele Carboni in 1675 to 1677. The original room ambience with a reverberation time of about 4 seconds and the original tracker noises are captured precisely within this project. This instrument is a typical historical Italian organ, which normally has one manual and a small pedalboard compass, serving only as a bass fundament. Italian historical organs normally serve especially for liturgical purposes and accompaniment of the choir, thus being not a special solistic instrument . There are no combined stops, such as mixtures with a common repetition scheme found in other European organs. The overtone stops are realized as separate Principal ranks (very often up to 1/8 ') which only repeat in high keys, such having the ability to built very special tonal structures and mixture-like sounds. A typical stop is the "Voce umana", which is not a reed stop, but a special slightly detuned pipe rank for chorus like effects. Italian organs are based on sonouros and warm Principal ranks and additionally have high and powerful overtone ranks for harpsichord like sounds. 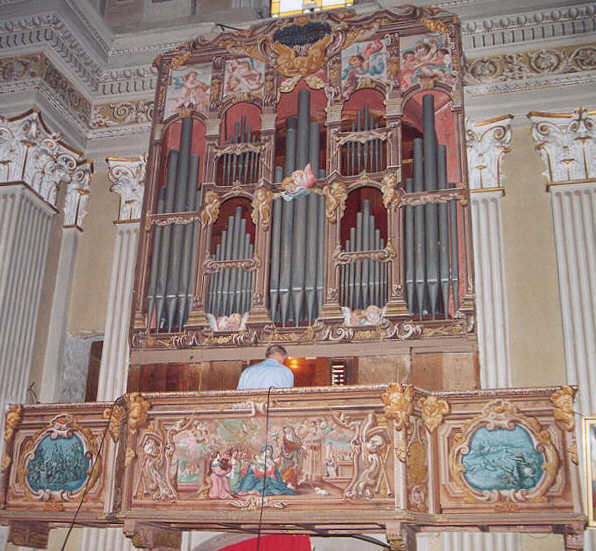 The organ has relations to Antegnati sound characteristics, having bright and rich overtones (compare the Venetian Callido 18th type). Another special feature is the "Terzo mano" (third hand), an intra-manual octave coupler, which leads to an extraordinary full sound, but which was probably first added in 18th or 19th century and shouldn't normally be used for 17th century music. Unfortunately the organ was set to equal temperament in the 19th century. To get back its 17th century sound, we decided to set back the organ to mean tone temperament. The organ now can again be heard in its probably most authentic sound. The Carboni organ is in a very good shape due to a lot of pilgrim donations for the Santuary.